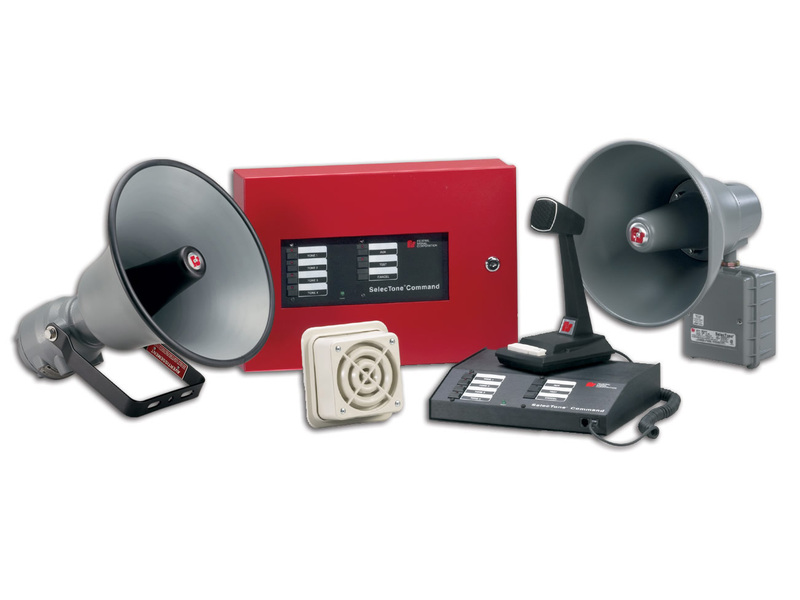 SelecTone systems cover the full range of industrial communication applications; start and dismissal, plant emergency evacuations, process control signaling, voice messages and public address. SelecTone Speaker/Amplifiers are self-amplified speakers designed to broadcast prerecorded tones, voice messages, melodies and live public address. Because the communication signal is amplified by each device, rather than by costly central amplifiers, the expense of running high-powered audio lines in conduit is eliminated. Each Speaker/Amplifier is designed for long life in harsh industrial environments. Systems provide limitless expansion for future grown. A range of models with outputs ranging from 88dBa to 114dBa are available to overcome industrial noise levels. Each has an integrated volume control. SelecTone Speaker/Amplifiers can be used to expand existing public address systems without adding central amps. Systems are fault tolerant if one device fails, the others continue to operate. Each Speaker/Amplifier can also be used for stand-alone signaling applications. SelecTone Command Units are the centerpiece of a total plant communication strategy. Each Command unit provides central control of four tones and public address. Each is equipped with local and remote microphone access and tone initiation. Auxiliary audio inputs support background music. Communication is prioritized with the local microphone as highest, followed by tones 1 through 4, remote microphone, then auxiliary audio. An onboard amp supports a local speaker. Rack mount, wall mount and desktop models are available. Connector Cards tie the SelecTone system together. Installed in each Speaker/Amplifier, Connector Cards provide communication with the SelecTone Command Unit. They can also be used to add SelecTone Speaker/Amplifiers to existing centrally amplified public address systems. Each Connector Card is designed to create a balanced line audio system for superior noise suppression and clear communication. Tone Modules offer tones, messages and melodies for every application, location and event. The Universal Tone Module (UTM) provides a selection of 32 distinct tones for use in plant-wide communication systems with a SelecTone Command Unit and a limitless number of Speaker/Amplifiers or for use in stand-alone applications with a single Speaker/Amplifier. Tones are easily selected via DIP switches and the modules are designed for quick plug-in installation. When a custom voice message, tone or melody is the solution, Federal Signal offers the TM33 Custom Tone Module. Users can select from a library of thousands of messages and melodies or they can provide a tape, script or digital sound file for professional recording in any language.